Ash dieback is continuing to dominate UK environmental headlines with the BBC and Guardian devoting considerable resources to the story today. CEH has been busy collating information relevant to the problem from our long-term UK data sets and projects, and also from our scientists who work on tree issues. Dr Michael Pocock, an ecologist from the Biological Records Centre (BRC) at CEH writes, "Based on the current evidence, it seems likely that the spread of ash dieback cannot be stopped in the UK. If this disease takes off and does kill many of our ash trees, in a similar manner to the sequence of events in other places in Europe, there is a potential for very serious impact on our countryside. Trees and woodlands are hugely important in our ecosystems, both in terms of capturing and storing carbon, within cities for decreasing air pollution, for recreation, for landscape aesthetics, and finally of course for wildlife." There are many insects and other animals and plants that depend on ash trees and ash woodland. Dr Marc Botham from CEH says, "Over 100 invertebrates have been recorded feeding on Ash in the Database of Insects and their Food Plants (DBIF) , including almost 50 moths, over 25 bugs and more than 20 beetles. Over a third of these have been recorded solely on Ash trees, with a number of mites and flies in particular, entirely dependent on them. In addition, some species like the Dusky Thorn, a moth found throughout England and Wales and whose caterpillars rely on ash, have already declined significantly across their range in the UK." Ecological background for ash can be found within the Online Atlas of British and Irish Flora on the Biological Records Centre website including 4 distribution maps. 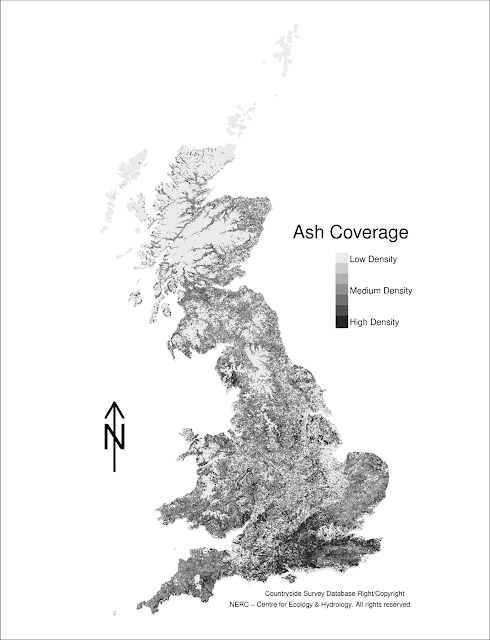 The BSBI Tetrad Map shows that ash has been recorded from most 2km squares - the gaps in England are recording gaps rather than genuine absence. Yesterday we published a summary of data on ash tree distribution using data analysis from one of our existing long-term, Great Britain (GB) wide data sources, the Countryside Survey (CS). The full analysis can be read here [PDF]. The CS team have done more work overnight and have just sent me an updated map showing ash coverage density within GB. Dr Lindsay Maskell writes, "We used CS data to work out the areal extent of Ash in each of the 32 (note not 45) CS land classes. Then using the 2007 Land Cover Map and the information it provides on the amount of broadleaved, mixed and yew woodland in each square kilometre across GB, the estimated areal extents were scaled accordingly." Guardian Can ash dieback be stopped in the UK? You don't mention Catocala fraxini, the Clifden nonpareil in your DBIF though, as the specific name indicates, larvae have been recorded from ash. This is the official blog of the CEH News Team at NERC's Centre for Ecology & Hydrology, intended to provide journalists and bloggers with more information on the latest stories about our science, as well as guest articles by CEH scientists. Our conker trees are going extinct ...Really?